Pure Country Dancers is a great place to line dance for both new and experienced dancers! 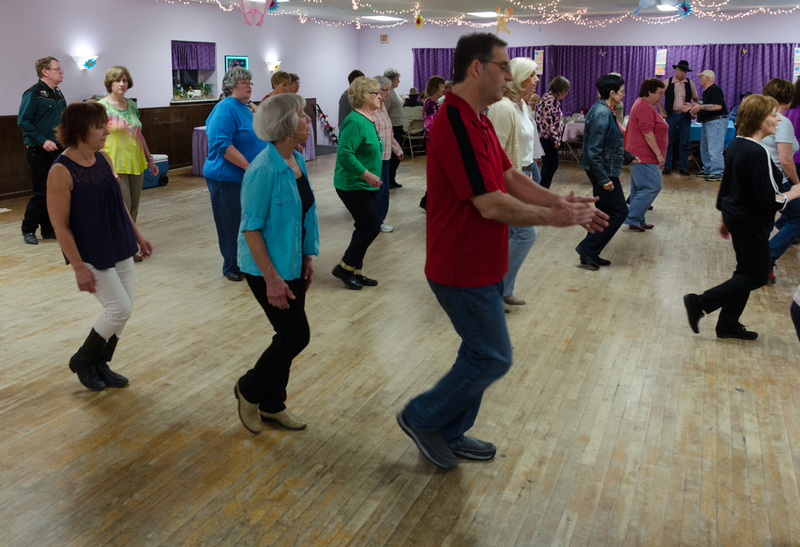 Pure Country Dancers (PCD) in Tatamy, PA, offers line dancing lessons and open dancing on Tuesday and Friday evenings. We welcome all levels of experience and offer a friendly, fun, and supportive atmosphere (there are no mistakes, only variations)! It's a great place to dance and socialize with new friends. Tuesday evenings are devoted to beginner dancers, and our experienced instructors will have you learning basic steps and easy dances right from the start. Friday evenings feature open dancing along with line and pattern partner lessons. We are not only country line dancing, we also dance to Pop, Latin and Oldies. Admission is $6 on Tuesday and $7 on Friday. We dance at Tatamy Fire House social hall (2nd Floor), which offers a large hardwood floor with plenty of room for both line and partner dancers.. Our location is central to dancers from the Lehigh Valley, the Poconos and Western New Jersey regions, with easy access off the new Tatamy exit off Route 33. Light snacks are included in the admission price - bottled water and soda are available for purchase. Our only advice is to wear shoes that will allow you to slide. So, if fun, exercise, and socializing, are high on your priority list, come on out and join us! Many of our dancers are members of the Pure Country Dancers (PCD) club organization. You do not need to be a member to dance but we would love to have you join us! The club was established in 1995 as a non-profit organization, and its primary mission is to provide dancing opportunities to its members and to the general public. The club meets three times a year to manage the dance experience and discuss club activities, and your membership entitles you to vote on club matters at meetings. The club's annual reorganization meeting will be held Sunday, January 7, 2018 at 1 PM, Tatamy Fire House. The club strives to be a contributing force to the community by supporting charities such as St. Jude Children's Research Hospital, Water Street Mission, the Nazareth Area Food Bank, and Lehigh University's Shop with a Cop program, among others. Dues are $15 per calendar year, and new members may join at any time. PCD holds four major events for members per year: Spring Fling, Annual Picnic, Halloween Party, and Christmas Party. There are opportunities for members to volunteer on committees for the events. We are a fun group and have quite a number of mini-events during the year in addition to our major events. Members are entitled to free admission to the picnic and free dinner and dance at the Christmas party. In addition, members receive a free dance pass for their birthday. Admission to Friday night dance is at a reduced rate of $6 for members. Members are required to collect admission at the door once a year (There is no admission fee for collectors). Club officers will provide direction and assist you. Members are also requested to participate in the yearly fundraiser. A PCD membership application is available at the admissions desk, and dues are payable in person to a club officer.